Heffter, Johann Carl, Museum disputatorium, Vol. 1, Zittau, 1756. A tripartite semantic database for authors, works (constituting the centerpiece) and secondary literature is compiled by all team members and serves as a working tool for all of them in turn. Representativity is ensured by using the categories of era, literary form and scientific discipline as a heuristic grid. The database keeps growing over the whole project duration and will comprise c. 1500 works in the end. 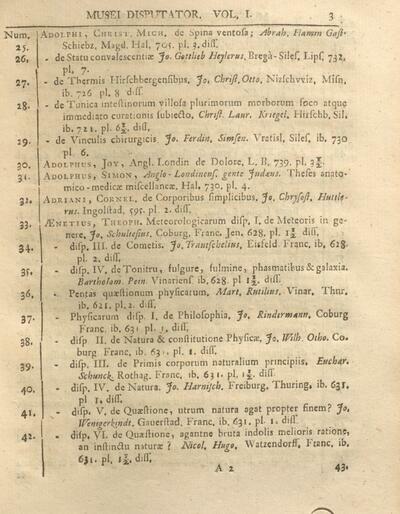 From the works listed in the database, c. 200 particularly typical items will be published online, resulting in a digital sourcebook - the first systematic selection of early modern scientific literature in Latin, providing a clear idea of the whole breadth of the field. Each work will be presented in a short introduction based on the informations given in the database. In addition to a facsimile, the text will be converted into a digitally searchable format, making use of the transcription platform "Transkribus" run by the Digitisation and Digital Preservation Group (DEA) of the University of Innsbruck. If a freely available translation exists, a link to it will be added. Each item will be referenced to similar datasets in the database so that it can be used as a starting point for research in a certain field. After the end of the project, the database and the sourcebook will remain accessible via the Central Computer Service of the University of Innsbruck and the research data repository Zenodo.